Warning: spoilers for the Legends of Tomorrow Season 1 finale and The Flash Season 2 finale are ahead! The CW DC shows have introduced a lot of characters from the comic book company’s gigantic library, but Legends of Tomorrow features the largest cast of heroes. Despite several cast members exiting, Season 2 is expected to feature many other protagonists working with the time travel team, but heroes from other shows may also get to participate. For instance, Jay Garrick, a.k.a. the Flash from Earth-3 in this continuity, was finally revealed earlier this week in The Flash Season 2 finale, and it’s possible he may appear as a member of the Justice Society of America. For me, personally, as an actor, Henry Allen was rather closed-ended, he was there for a purpose, he served his purpose, it was time for him to die. The fact that I’m now getting to morph into an entirely different character that is so important to the Justice Society of America, which also bleeds into Legends of Tomorrow, he’s such an important character to this whole world – it just opens up enormous possibilities for me as an actor going forward, and the challenge for me, having played Henry, is that I now get to create an entirely different character going forward. 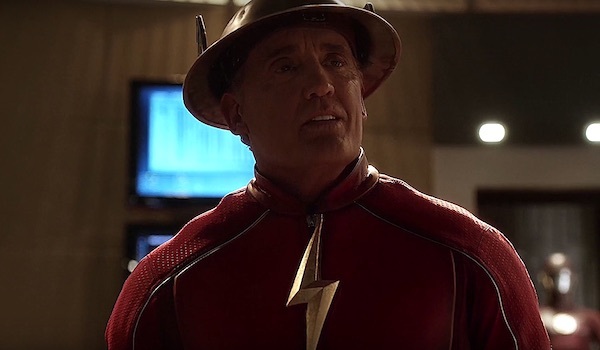 Although the real Jay Garrick technically first appeared at the end of The Flash’s “Welcome to Earth-2,” his face was obscured by an iron mask, and it wasn’t until the Season 2 finale, titled “The Race of his Life,” that fans learned who he was. He’s now free from Zoom’s control and back to continuing his speedster duties. While we expect him to remain a recurring figure on The Flash during Season 3 and maybe beyond, it would be cool to see him appear in an episode or two of Legends of Tomorrow Season 2. In the final minutes of the Legends of Tomorrow Season 1 finale, titled “Legendary,” the team was found by a mysterious man (arriving in 2016 on another version of the Waverider) who warned them that they would die if they boarded the Waverider for their next mission. When Rip Hunter asked who he was, the man introduced himself as Rex Tyler, a member of the Justice Society of America (played by Suits star Patrick J. Adams). Comic book fans know Rex as Hourman, and both he and Jay were both original JSA members in the Golden Age. However, it hasn’t been made clear yet whether Legends of Tomorrow’s JSA hails from another Earth or simply resides in another time period on Earth-1. Either way, if Jay showed up on the series, we wouldn’t expect him to be a regular member of the team, but it would still be a great nod to see him fighting alongside his closes allies from the comics. Both The Flash and Legends of Tomorrow will return to The CW in the fall, but stay tuned for casting announcements and other news for these shows during the summer.